Home / launch / oppo / portrait / selfie / smartphone / OPPO F11 Pro launches in the Philippines. | Gizmo Manila. 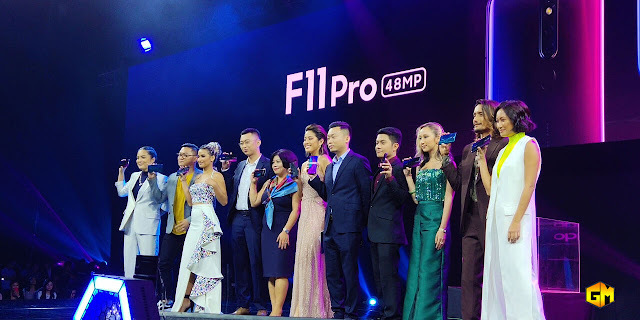 OPPO F11 Pro launches in the Philippines. | Gizmo Manila. OPPO launched the newest device addition to the F Series, the OPPO F11Pro. This new device showcases the upgrade from selfies to brilliant portraits by featuring a 48MP image sensor. This innovation will provide users with an unprecedented night photography experience. OPPO introduced a new set of ambassadors for the F11 Pro, it's not just celebrities but professionals from different league who selected with utmost criteria, these individuals’ unique stories embody what the F11 Series stands for: the ability to shine in the dark, no matter the circumstance. In the previous F Series, the OPPO focus on Front Camera but with the F11 Pro you cannot only take great selfies but also Brilliant Portraits even on a low-light situation using its Rear Camera. Yes you heard it right! the OPPO F11 Pro will not only focus on selfie but also for taking photos using the 48MP f/1.7 aperture Triple Rear Camera. the F11 series comes equipped with a 4,000mAh battery which is 500 mAh higher than the previous F series smartphone. The brand new VOOC 3.0 flash charging technology is further improved to shorten charging time by 20 minutes. This means the F11 series can be charged within 80 minutes. Now, VOOC has over 90,000,000 users. The F11 Pro 6GB/64GB will be available at PHP 18,990, A quite good for its price since a lot of people expected to match the price of the Vivo V15 Pro. Customers can start pre-order stating today until April 5, Customers who pre-order will get Speaker worth PHP 2,500. You can also avail the F11 Pro via Home Credit at 0% interest for 9 month and months installment plan starting March 28. The F11 Pro will also be available in Postpaid Plans for Globe and Smart.